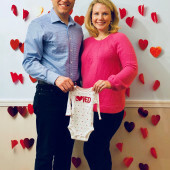 We are so excited to welcome Baby Girl Frazee this August! Thank you for your support as we embark on this epic journey into parenthood! We know it will take a village! We have not listed many clothing, book, or toy items on here mainly because we know people love to individually pick those items out! Also, we know we will need lots of diapers and wipes. We have listed below the brands we are opting to use. We know we have some big ticket items on here (who knew babies were so expensive?!). We appreciate any gift, big or small, and would definitely be appreciative of gift cards to go towards more expensive items and all of the diapers we will need to buy! Tips: We have tried to list common websites and stores to buy the products from and with the best prices, but if you would like to buy from another retailer or find a better price, please do what you feel is best! BuyBuyBaby is from the same company as BedBathandBeyond, so many of their coupons will be honored at BuyBuyBaby. Also, BuyBuyBaby often has 20% off one item coupons as well.